Cindy Lou -- I Love YOU! Schnibbles, Schnibbles, Schnibbles..... there will be a few Schnibbles passing through blog land in the next day or two. Cindy Lou Who was the pattern of choice for the month of October. I was not going to make this one, mostly because I did not have a moment of inspiration about color choices, and because the pattern was not available locally. But on a return trip, we stopped in the Olde Green Cupboard in Jacksonville Florida, and there she was! Cindy Lou Who in all of her glory :-) I loved the colors and of course wanted the fabrics they had chosen. No way! This sample was made up two years ago, and the fabrics were all gone of course. So I studied it, bought some similar fabric and was on the hunt for the pattern. I love how she turned out and I was up til the wee hours last night doing the quilting. I had to post this today because Cindy Lou is going to have to take a rest while I have other pressing projects to complete. And have you ever visited Kelly at I Have a Notion? She's such a sweet and funny gal and has such great prices on all of her notions and supplies. Well about a week ago I found out that she had drawn my name for a signed copy of a yet to be released Edyta Sitar book called "Friendship Triangles". This book is so beautiful and has some gorgeous quilts. Here is a sneek peek! 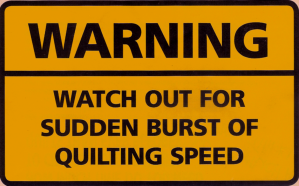 Have a happy Quilting weekend! What will you be up to? I have been on busy street this week, so it's been a couple of days since I've posted anything. 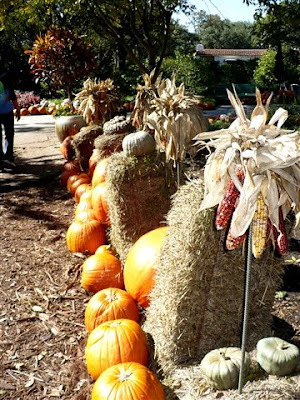 Projects are looming, but I wanted to post these sweet pumpkin pictures that my friend Sharon(no blog) shared with me. Enjoy! And Yes I had to number all of my blocks, because knowing me I would have gotten them out of order. And NO the Grinch did NOT return my block, so I had to make another one. And even the extra 2" squares that make up the star. He must have really liked the fabric. The Grinch stole one of my blocks!!! I KNOW he did! And I want it back!!! It's a shop hopping weekend here in our area. We love hopping to the LQS and taking in all of the lovely fabric, samples and other goodies. 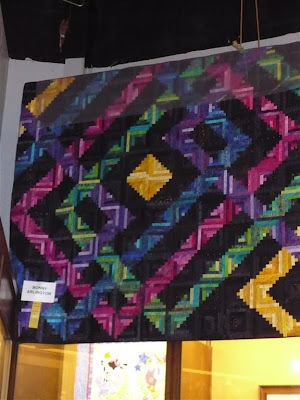 Here is a quilt that caught our eye! But I was able to finish an orphan block along the way. It's always nice to finish - - something! Hope your weekend is a quilty one! Happy quilting. Okay, so I've been sewing the last two days! I've been working on Cindy Lou Who but "doing it my way", so I hope that it will all come together. I've only got 9 days left to make the finish line. And while I was at it, I could not sleep one night (too many family stretching things on my mind), and I needed to make a quickie quilt for a gift. It's for a boy, which my fabric stash is slim pickins in the boy department. But I found some patriotic fabrics that would work. Anyway, I did not have quite enough so again I went plundering through the scrap pile. I found this panel, which I think I'd like to work into the backing. I actually did not know I had this because it came in a box that another quilter gave me. Isn't it so nice to share? It is coming together very nicely. 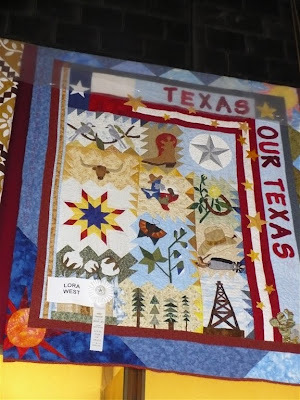 I have never been to the great state of Texas, but I have a very dear friend Sharon (no blog) who lives in Garland Texas. She and her family recently went to the State Fair. She knows how much I love to quilt, so she sent me a few pictures. Don't you just love the boots? And I think this one is my favorite. I thought that might catch you attention :-) There are so many giveaways going on this week, that you might want to check them all out. Please mention that you saw it here, on my blog. Woo-hoo fun times ahead. First, Pumpkin Patch Primitives is giving away a Fat Quarter Bundle of Red Rooster's Pumpkins & Spice Fabrics. Yes that is 27 Fat quarters! If she gets 250 signers, there will be two bundles. AND if she gets 350 to sign up there is a $100 gift certificate! So hop, hop, hop over. Barb's Good Life is giving away the cutest Santa and a Holiday cookbook. Please stop over and take a look. My sweet friend Kelly at I Have a Notion is giving away a new book that is not even out yet. "Friendship Triangles" by Edyta Sitar. It is a signed copy with lots of great new patterns. The Quilting Cat's Birthday give away is a jelly roll friendly quilt pattern, a Garden Inspirations jelly roll by Moda, and a packet of Christmas applique designs! And finally (whew) over at Molly's Place, Molly is giving away a years subscription to McCall's Quilting. Now be sure to check these out quickly, as some are soon to expire. And tell them you came over from the Happy Cottage Quilter :-) It's a harvest of giveaways this week! p.s. Since writing this post, I found one more lovely giveaway. Becky's Photography is having a 100th post giveaway. Stop by and leave your name by Thursday night. I've only been there once before, and it is such an incredible quilt shop. They were starting to decorate for Christmas already. Just makes your heart go pitter patter with inspiration. Today is such a special day. 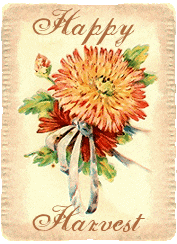 And I did not want the day to end without sending a special Happy Birthday message to my sweet sister in love and quilting buddy. HAPPY BIRTHDAY Miss Rosey from all of your best friends! Don't you just love it when the mailman brings you quilty goodness? Well today he was very good to me. Not only was there a new quilting magazine, but a package arrived as well! Lori over at A Bee in my Bonnet was having a 100th post giveaway, and she drew my name as one of the winners!! "Scarecrow" and "Thanksgiving". Not only are they great looking quilts, but they would make very cute stand alone projects too. Ooooo! "Grandma's Apron Pillow" and "1930's Black & White". I've always loved Lori's Apron quilt. And the 1930's pattern will make great use of my scrap stash. Thank you Lori! I love them all! My sister in love made this quilt. But it's always so much more fun when you can do it with your quilting buddies. 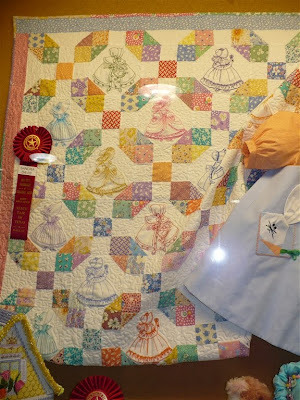 Please be sure to stop by and visit Park City Girl's Bloggers Quilt Festival. I participated when Amy held one last spring, and it is a lot of fun, plus you get to see so many beautiful quilts. For this year I am sharing my Schnibbles quilt Winter White which can be found on this post. I loved the beautiful Glace fabrics. They are a cool and hot combination. Please stop by and take a look. 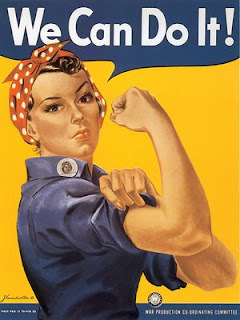 And also take a walk through the other quilters blogs. 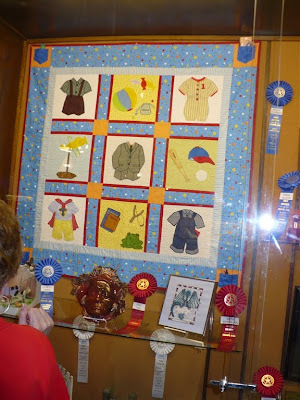 You will not only enjoy the quilts, but you will find so many talented and creative quilters. I know this has been said before on several other blogs, but I would like to encourage everyone to be helping hands. Barb from Bejeweled Quilts by Barb lives in America Samoa, where they were hit by the Tsunami last week. Barb and her family are safe, but there are needs. Many people have lost everything. If you would like to help, please send Barb or Pat an email. Barb suggested sending priority flat rate boxes. It costs us only half as much to ship this way then in our own boxes. Also many of you already know about the accident that happened to Terry's ( Terry's Treasures) husband. 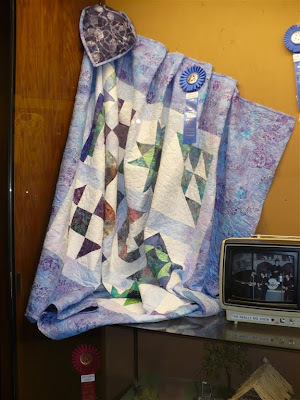 Please go to Laurie's blog ( A Yankee Quilter), and find out how to donate a quilt block that will go towards a comfort quilt for Terry's family. We are a big quilting community, and with each others help, we can send some comfort and relief to those in need. Thank you for taking the time to read this post and to make an effort to do something for one of our fellow quilters. Let's start off the day and the week with some good news!! DENA of Threads to Fabric. If you have never visited Dena's blog, you are missing a special treat. Dena is a sweet gal, and has a wonderful blog. She recently wrote a tutorial on how to do paper piecing. That's one I'm saving, as I've never done paper piecing before. And thanks to all of you that stopped by and left a comment on my giveaway. It's always a pleasure to hear from you. And please stand by, because there may be another little giveaway coming up soon! Do you remember that crazy movie?? It's a movie with Don Knotts involving some of his antics. Or do you just think about the days when a bottle of soda (pop) required a nickel deposit, and when you returned the bottle, you got your nickel back? Well, I really enjoy reading everyone's comments on my blog. But sometimes there is a little problem. You see, when you leave a comment on my blog, I would really love to be able to send a reply back. Many of you write a comment but when I try to reply, I can't send you a message back because there is no where to send it. Do you know if you are leaving a no-reply message? •near your picture or logo on the left, click "Edit Profile"
•go to the first section labeled "Privacy"
•in this section, the third line down should say "Show Email Address"
•make sure the IS a Check Mark in the "Show Email Address"
•The MOST IMPORTANT part when you finish, is to go to the bottom of the page and click "Save Profile" on the bottom left side. If you do not click save it won't work. Now I have a message for Sharon (no-reply) who asked about the quilt hanging in my friends sewing room. She wanted to know which pattern it was. Sharon, the pattern is called "The Blooming Nine Patch" and it is in the book "Traditions with a Twist" by Blanche Young. And please remember that you can still sign up for my giveaway. I will be closing the comments tonight. Go back to this post to leave a comment. I'd really love to hear from you. Have a great weekend. And happy quilting! The first Schnibbles pattern for the Year of Schnibbles. I was a little confused about when we were supposed to show this quilt, so I hope that I did not miss the deadline. The problems with getting a hold of the fabric set me back a bit, but here it is. I also was trying to do a little more free motion quilting following along with Mary Mashuta's Foolproof Machine Quilting. Her method uses the walking foot, which I think give a little more control. Looking forward to seeing the other Winter White quilts. 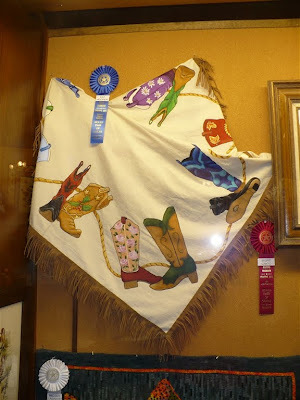 ** I am joining Park City Girl and her Fall Quilt Festival. 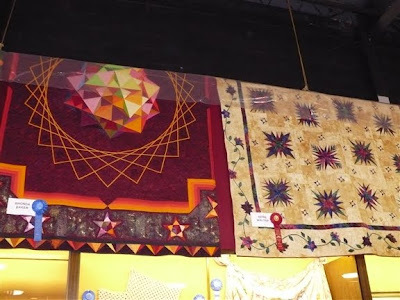 Please be sure to stop by and visit all the other beautiful quilts that will be displayed this weekend!